As with most large parrots, Eclectus can live for a long time. In captivity, it's not uncommon for them to reach 30 years old, though some live past 50 with proper care. 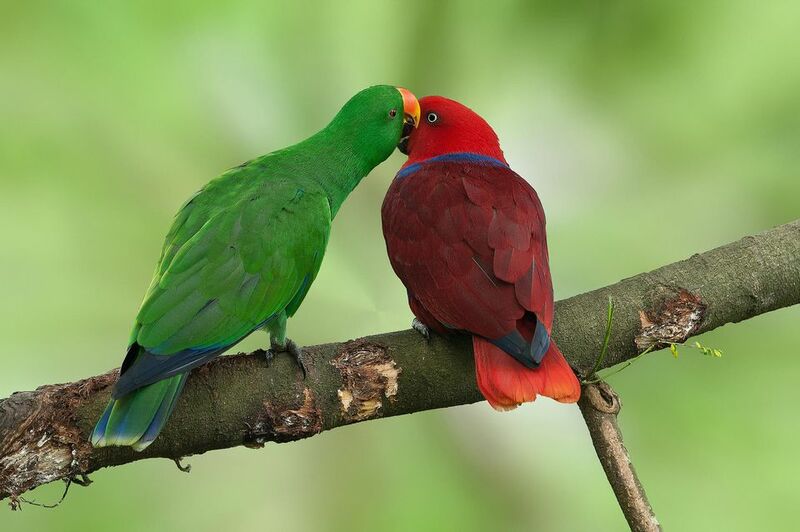 The Eclectus is a very friendly and intelligent bird species that's often described as gentle, tranquil, and caring. Many thrive on the time they get to spend with their owners and do well when a time for socialization is incorporated into a daily routine. Then again, a female Eclectus can be bossier and, at times, more aggressive than a male. This is particularly true when she's breeding. Even on her own in captivity, her nesting instincts will remain strong. You might find her trying to nest in secluded areas of your home. What really makes both male and female Eclectus stand out is the appearance of the feathers. Rather than the distinct lines found on many birds, the feathers seem to blend together. When this is paired with the extremely vivid color, it's almost as if someone painted fine fir on these birds. Surprisingly, this coloring is brilliant camouflage in their native habitat and they're often heard before they're seen. Their gentle nature does mean that an Eclectus can do well with children. However, they don't like to be startled and prefer a calm environment, so it's important to consider if your family dynamic is a good match for that personality. Around 18 months of age, the birds begin to reach sexual maturity. Sometimes this brings with it some aggression or the instinct to "feed" whatever is nearby. You may notice some naughty behavior during this transition, but it's generally advised to ignore it and turn to distraction techniques instead of reinforcing it. With time, they pass through the phase and learn what's acceptable. Another peculiarity for the Eclectus is toe-tapping and wing-flipping. This is similar to feather plucking, which is a common behavioral issue with parrots who feel neglected. However, when the three actions occur in an Eclectus, it can be a sign of a serious health issue. Nutritional deficiencies caused by excess vitamins and minerals, fortified foods, or artificial ingredients as well as eating foreign objects like beads, or stress are probable causes. It's important to see an avian vet right away. The Eclectus has a specialized digestive tract that is different from many other bird species. Due to this, they need to be fed a diet high in fiber and low in fat. It's also best to avoid too many vitamin and mineral supplements, which could lead to digestive tumors or abnormal behavior. In the wild, they prefer pomegranate, papaya, and figs, though they'll also eat flowers, buds on trees, and a few seeds. As a pet, it's important that their diet is comprised of fresh fruits, vegetables, and carbohydrates. Cooked pasta or grain bake—a homemade casserole just for birds—will ensure they get all the necessary carbs. The Eclectus are active birds and need plenty of room to exercise. They should have access to a large play stand and a "bird-safe" area in which to climb and explore. Proper exercise helps the Eclectus maintain its physical and mental health, and is a necessity for a happy, healthy pet. You'll also want to provide these birds with many perches of different materials and diameters so their feet remain healthy. A climbing ladder, swings, and a slew of fun toys to beat up and chew on will also make the Eclectus happy. If provided with enough stimulation, they do a better job than many parrots at keeping themselves occupied when you're not around. The more challenges you can give these smart birds, the better.